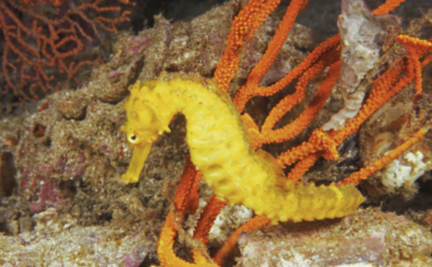 Seahorses live in shallow tropical and temperate waters, anchoring themselves to sea grasses and coral. They face threats from bycatch, incidental capture and habitat degradation. Unlike most other fish, they are monogamous and mate for life. Rarer still, they are among the only animal species on Earth in which the male bears the unborn young.